2018, marked the centaury of the death of Billy Powell, the only son and heir of Captain and Mrs. Edward Powell, of Nanteos. His death was a great loss to the family and close community; and ending the line of the Powell family at Nanteos. 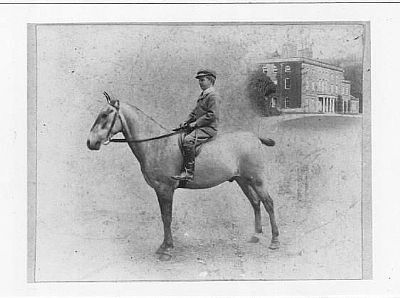 William Edward George Pryse Wynne Powell was born on the 8 March 1899, at Betley House, a large Victorian Gothic house in Lyth Hill Road, Bayston Hill near Shrewsbury, at the home of medical surgeon Professor Ernest W White M.B. (London). William was known as Billy to his family and associates throughout his life but his father affectionately called him 'Ick'. 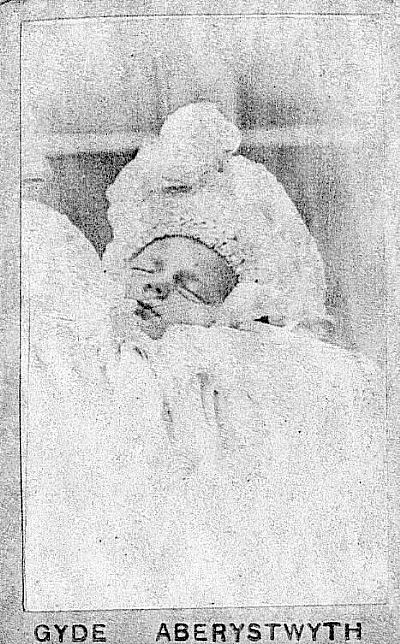 An official christening photograph was taken on the day of his christening on the 26 April 1899, with his parents Edward Athelstan Lewis Powell and Margaret Louisa Joan (Pryse) Powell. Together with his grandparents Sir Pryse Pryse, Bart, of Gogerddan and his wife Louisa Joan (Lewes); and William Beauclerk Powell of and his wife Anna Maria (Lewis) of Nanteos, on the grounds at Nanteos. 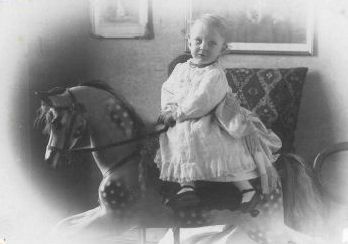 Above is Billy Powell aged about two years of age on his rocking horse that was kept in the cupboard near the nurseries on the second floor of Nanteos (and kept there for many years). 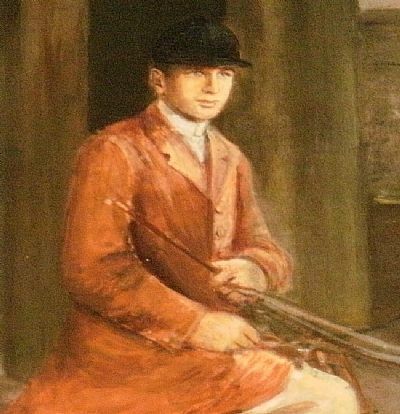 He had a great fondness of horses, and would attend the hunt from an early age. His father documented their delights and plights in his hunting diaries, they often went hunting together when 'Ick' came home from school. He attended Preparatory School in Aldershot in 1914 aged 15, there he would have had physical drill and bayonet training, this was essential training for a Lieutenant. 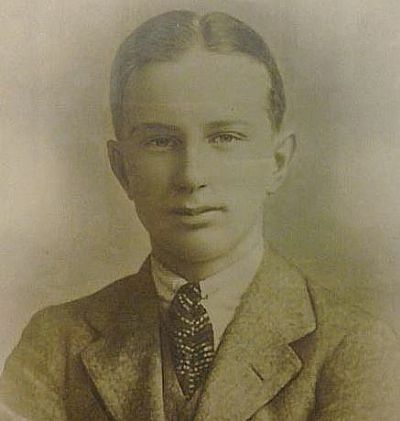 Billy left Eton College on 12 September 1917, and joined the 1st Welsh Guards Battalion, ranked as Second lieutenant, based in France in August 1918. Tragedy struck, when Billy was killed during battle. Edward and Margaret Powell had lost their only son and furthermore the heir to the Nanteos estate. 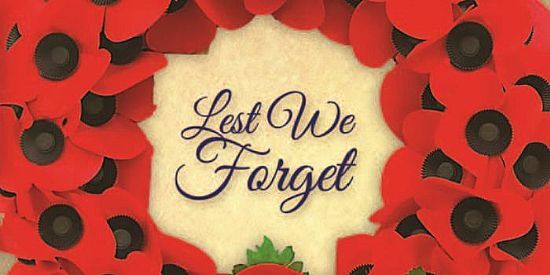 It is said that while the Powells were celebrating the end of the First World War at Nanteos, the telegram arrived with the devastating news of Billy’s death in France. The tragic news shook the whole community. 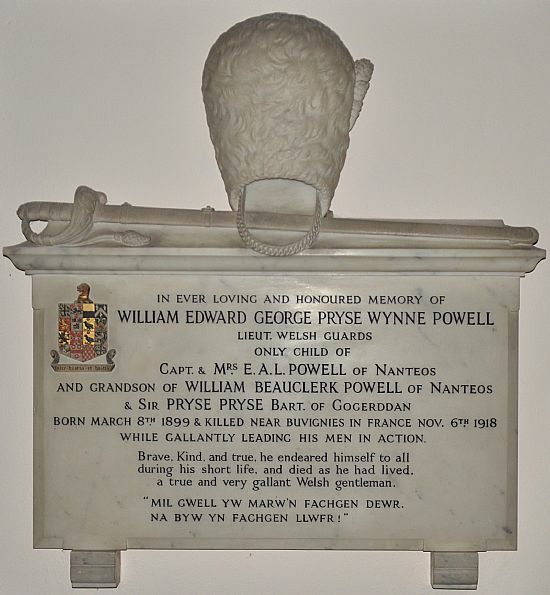 William Edward George Pryse Wynne Powell was killed on the battlefield in Bayai France, on the 6 November 1918, (five days before the Armistice). He was nineteen-years of age. His death was a devastating blow not only to the family but also to the Nanteos estate; it signalled the end of the Powell line at Nanteos. It was believed by some people that Billy Powell was shot by his own men during the battle, it can be clearly seen from the above in C. H. Dudley Ward’s vivid account of the battle in the History of the Welsh Guards, 1920, that it was not the case. Billy was buried at Buvignies; then his body was relocated at the end of the War to Maubege Centre Cemetery in France, in Row C, grave 46. 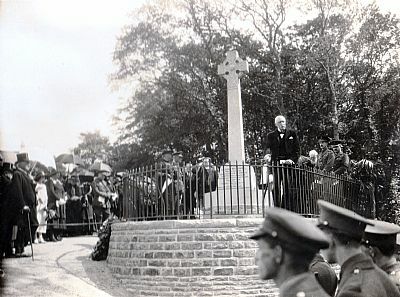 A memorial service was held on Saturday January 8 1921 at 2:30pm at St Padarn Church in Llanbadarn Fawr, and the unveiling of the memorial in Southgate took place on the 31 May 1922. 158 tenants subscribed to the building of the Powell memorial in Southgate raising £300 10s to cover the costs of it's build. And Mrs Powell of Nanteos. Splendid the passed – the young, the brave. And employees of the Nanteos Estate. Ddeiliaid a gweitheyr Ystad Nanteos. There are other memorial plaques to Billy Powell in the surrounding chapels. There are marble plaques at Moriah Chapel, Capel Seion Chapel, and at Horeb Chapel. 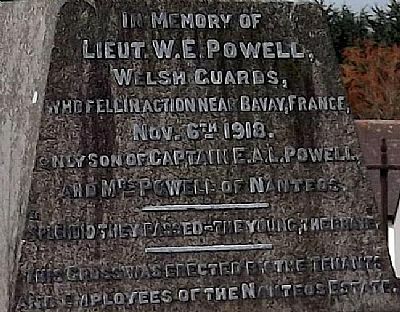 He is also listed on the Llanbadarn Fawr War Memorial, the Penparcau War Memorial plaque, and commemorated at Eton College, along with other fallen comrades. 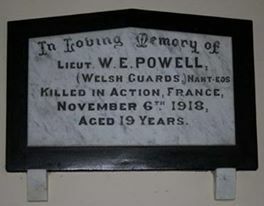 Below is William E. G. P. W. Powell's memorial plaque, located near the Alter, at St. Padarn church in Llanbadarn Fawr, along with other memorials of the Powell family. * Old Photographs by kind permission from The Maggie Williams collecton.